A house fire can result in substantial property damage or even a total loss. A fire can also lead to serious injuries and in some cases, fatalities. Many residential fires can be prevented. Here are some simple fire safety tips that you can follow to protect your loved ones and your property. Following fire safety tips may seem unimportant at first glance, but if a fire breaks out, you will be glad that you took the time to prepare for this type of event. Keep in mind that some fires are preventable, such as electrical fires from power cords. Because a small spark or flame could grow into a devastating house fire in minutes, it’s critical to take steps to prevent a fire from ever starting. These fire safety tips will help you to protect your home against this threat. Functional fire extinguishers provide you with a fast and effective way to tackle small fires in the home. A common place where house fires start is in the kitchen, so placing a fire extinguisher underneath the kitchen sink is an excellent idea. Check the extinguisher periodically to make sure it isn’t expired. Remember that you should evacuate the home quickly if you cannot put out the flames right away. Regularly inspecting power cords throughout your home is an effective way to prevent some house fires. Damaged cords with exposed wiring can create sparks that could ignite a major fire. When you are following fire safety tips at home, get in the habit of reviewing the condition of all electrical cords in the home every few months. Damaged cords should be repaired with electrical tape or be tossed out. The laundry room is another common area where fires can start. When the dryer runs, it creates super-heated air that ultimately may catch fuzz and lint on fire. 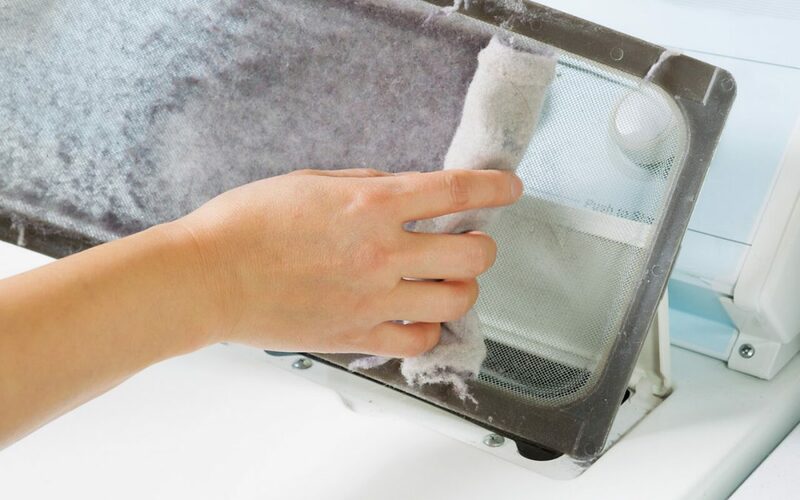 Your dryer’s lint trap should be cleaned before each use to reduce the risk of a fire. In addition, the dryer vent leading to the outside of your home may also collect debris that must be removed periodically. Schedule a professional vent cleaning service annually to ensure this vent is free from debris and lint. Even when you do your best to prevent house fires, there is a chance that a fire may still break out. Consider that lightning strikes, sparks from a barbecue grill, fireworks, and other things may still pose a risk to your home. You must prepare for the possibility of a fire in order to stay safe. First, smoke detectors should be in several locations throughout the home. This includes installing a fire detector in each bedroom. Check the batteries a few times a year and change them as needed. Second, prepare a fire safety plan for your family. As a group, decide on a meeting place outside of the home in the event of a fire. All family members should be educated about fire safety tips. This includes understanding the need to get out quickly and how to safely escape from each room at the time of a fire. You can see that some fires are preventable, but there are still risks regardless of the steps that you take to protect your home. Use these fire safety tips to keep your home and family safe. JS Consulting Group serves Southern California with home inspection and consulting services. Contact us to book an appointment.